The Blue Ridge Motor Lodge in Ashville, NC was definitely a good starting point for day three of our trip. We grabbed McDonalds for breakfast by walking across the street. Then we gassed up at a gas station just next to the McDonalds. Six miles later we we entering the Blue Ridge Parkway! 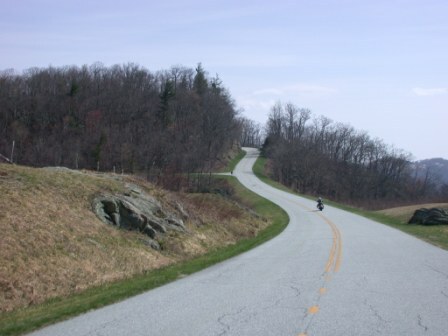 When we visited the Blue Ridge Parkway back in the spring it was still winter up in the mountains. But now it was late summer and the mountains were covered in lush greens. Here is a picture for comparison. I think they were taken in the same spot. The scenery was spectacular now that the forest looked alive! We crossed the Linn Cove Viaduct and saw Grandfather Mountain again. We used the new Cannon camera with it’s 20x zoom to get some great shots of both. It was getting to be late afternoon and we needed fuel for our bikes and our stomachs. Although we could probably keep riding on low I was feeling like we better eat soon. We found a cool place to stop for lunch that deserves a blog post of it’s own (already posted). After lunch we got back on the parkway and got off at Rt 89. We were behind schedule and this time decided to consult the maps and change up the route plan. We decided to super slab it if we wanted to get to the motel at a decent hour. There was a mexican restaurant attached to the Days Inn lobby and we arrived just in time to be the last patrons served for the day. Mexican food and beer after a long day in the saddle hits the spot!